Besançon (French and Arpitan: [bəzɑ̃sɔ̃]; archaic German: Bisanz, Latin: Vesontio) is the capital of the department of Doubs and of the Bourgogne-Franche-Comté region in eastern France, close to the border with Switzerland. 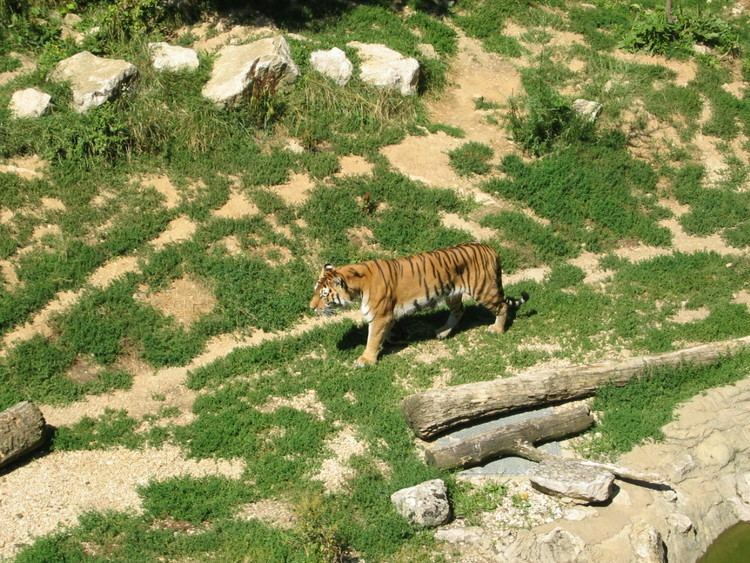 In 2013, it had a population of 116,952. The city is first recorded in 58 BC as Vesontio in the Book I of Julius Caesar's Commentarii de Bello Gallico. The etymology of Vesontio is uncertain. The most common explanation is that the name is of Celtic origin, derived from wes, meaning 'mountain'. During the 4th century, the letter B took the place of the V, and the city name changed to Besontio or Bisontion and then underwent several transformations to become Besançon in 1243. 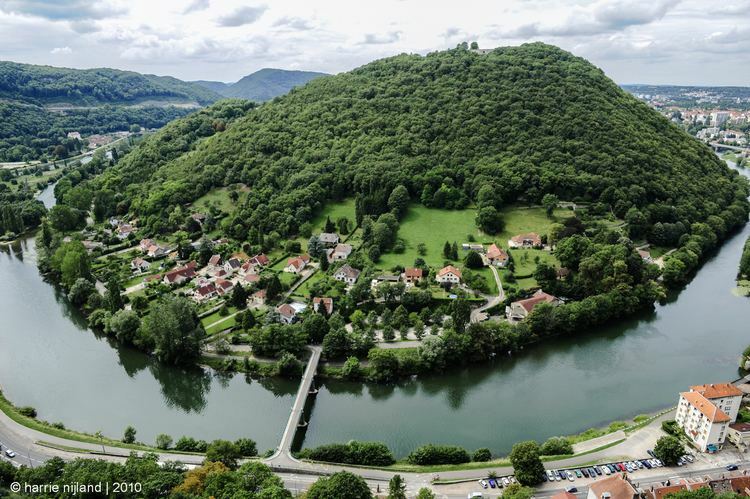 The city sits within an oxbow of the Doubs River (a tributary of the Saône River); a mountain closes the fourth side. During the Bronze Age, c.1500 BCE, tribes of Gauls settled the oxbow. From the 1st century BC through the modern era, the town had a significant military importance because the Alps rise abruptly to its immediate south, presenting a significant natural barrier. The Arar (Saône) River formed part of the border between the Haedui and their hereditary rivals, the Sequani. According to Strabo, the cause of the conflict was commercial. Each tribe claimed the Arar and the tolls on trade along it. The Sequani controlled access to the Rhine River and had built an oppidum (a fortified town) at Vesontio to protect their interests. The Sequani defeated and massacred the Haedui at the Battle of Magetobriga, with the help of the Arverni tribe and the Germanic Suebi tribe under the Germanic king Ariovistus. Over the centuries, the name permutated to become Besantio, Besontion, Bisanz in Middle High German and gradually arrived at the modern French Besançon. The locals retain their ancient heritage referring to themselves as Bisontins (feminine: Bisontine). It has been an archbishopric since the 4th century. In 843, the Treaty of Verdun divided up Charlemagne's empire. Besançon became part of Lotharingie, under the Duke of Burgundy. As part of the Holy Roman Empire since 1034, the city became an archbishopric, and was designated the Free Imperial City of Besançon (an autonomous city-state under the Holy Roman Emperor) in 1184. In 1157, Emperor Frederick Barbarossa held the Diet of Besançon. There, Cardinal Orlando Bandinelli (the future Pope Alexander III, then adviser of Pope Adrian IV) openly asserted before the Emperor that the imperial dignity was a papal beneficium (in the more general sense of favour, not the strict feudal sense of fief), which incurred the wrath of the German princes. He would have fallen on the spot under the battle-axe of his lifelong foe, Otto of Wittelsbach, had Frederick not intervened. The Imperial Chancellor Rainald of Dassel then inaugurated a German policy that insisted upon the rights and the power of the German kings, the strengthening of the Church in the German Empire, the lordship of Italy and the humiliation of the Papacy. The Archbishops were elevated to Princes of the Holy Roman Empire in 1288. The close connection to the Empire is reflected in the city's coat of arms. In 1290, after a century of fighting against the power of the archbishops, the Emperor granted Besançon its independence. In the 15th century, Besançon came under the influence of the dukes of Burgundy. After the marriage of Mary of Burgundy to Maximilian I, Holy Roman Emperor, the city was in effect a Habsburg fief. In 1519 Charles V, Holy Roman Emperor, King of Spain, became the Holy Roman Emperor. This made him master of Franche-Comté and Besançon, a francophone German city. In 1526 the city obtained the right to mint coins, which it continued to strike until 1673. Nevertheless, all coins bore the name of Charles V.
When Charles V abdicated in 1555, he gave Franche-Comté to his son, Philip II, King of Spain. Besançon remained a free imperial city under the protection of the King of Spain. In 1598, Philip II gave the province to his daughter on her marriage to an Austrian archduke. It remained formally a portion of the Empire until its cession at the peace of Westphalia in 1648. Spain regained control of Franche-Comté and the city lost its status as a free city. Then in 1667, Louis XIV claimed the province as a consequence of his marriage to Marie-Thérèse of Spain in the War of Devolution. Louis conquered the city for the first time in 1668, but the Treaty of Aix-la-Chapelle returned it to Spain within a matter of months. While it was in French hands, the famed military engineer Vauban visited the city and drew up plans for its fortification. The Spaniards built the main centre point of the city's defences, "la Citadelle", siting it on Mont Saint-Étienne, which closes the neck of the oxbow that is the site of the original town. In their construction, the Spaniards followed Vauban's designs. In 1674, French troops recaptured the city, which the Treaty of Nijmegen (1678) then awarded to France. At this time the city became the administrative centre for Franche-Comté, with its own Parlement of Besançon, which replaced Dole. As a result of control passing to France, Vauban returned to working on the citadel's fortifications, and those of the city. This process lasted until 1711, some 30 years, and the walls built then surround the city. Between the train station and the central city there is a complex moat system that now serves road traffic. Numerous forts, some of which date back to that time and that incorporate Vauban's designs elements sit on the six hills that surround the city: Fort de Trois Châtels, Fort Chaudanne, Fort du Petit Chaudanne, Fort Griffon, Fort des Justices, Fort de Beauregard and Fort de Brégille. The citadel itself has two dry moats, with an outer and inner court. In the evenings, the illuminated Citadelle stands above the city as a landmark and a testament to Vauban's genius as a military engineer. In 1814 the Austrians invaded and bombarded the city. It also occupied an important position during the Franco-Prussian War of 1870–71. The Nazis occupied the citadel during World War II. Between 1940 and 1944, the Germans executed some one hundred French resistance fighters there. However, Besançon saw little action during the war. The allies bombed the railway complex in 1943, and the next year the Germans resisted the U.S. advance for four days. Besançon was also the location, between 1940 and 1941, of an Internment Camp (Konzentrationslager), Frontstalag 142, also known as Caserne Vauban, which the Germans set up for 3-4,000 holders of British passports, all women and children. The conditions were harsh; many hundreds of internees died of pneumonia, diarrhea, food poisoning, dysentery, and frostbite. In 1959, the French Army turned the citadel over to the city of Besançon, which turned it into a museum. The forts of Brégille and Beauregard sit across the Doubs from the city. In 1913, a private company built a funicular to the Brégille Heights. The funicular passed from private ownership to the SNCF, who finally closed it in 1987. The funicular's tracks, stations and even road signs remain in place to this day. Besançon is located in the north-east quarter of France on the Doubs River. It is about 325 kilometres (202 miles) east of the national capital of Paris, 100 kilometres (62 miles) east of Dijon in Burgundy, 125 km (78 mi) northwest of Lausanne in Switzerland, and 100 km (62 mi) southwest of Belfort in Bourgogne-Franche-Comté. It is located at the edge of the Jura Mountains. Besançon is under the influence of both an oceanic climate (notable precipitations in quantity as much as in frequency) and a continental climate with hard winters (snow, frost) and warm and dry summers. The year-round average is 11.5 °C (53 °F). The warmest month is July 20 °C (68 °F) and the coldest is January 2.1 °C (36 °F). Besançon receives about 1,059 mm (42 in) of precipitation per year. The wettest month is May (108.4 mm (4.3 in)); the driest is August (76.9 mm (3.0 in)). The highest temperature ever, recorded on 28 July 1921, was 40.3 °C (104.5 °F), and the lowest was a −20.7 °C (−5.3 °F) reached on 1 January 1985. As of the French Census of 2012, the population of the City of Besançon was 116,353, lower than the historical peak of 120,315 in 1975. Grand Besançon covers 122 km2 (47 sq mi), 11 municipalities and has a population of 135,652. The metropolitan area covers 1,652 km2 (638 sq mi), 234 municipalities and has 236,968 inhabitants. It is the thirty-seventh of France. It increased by 6.6% between 1999 and 2008. 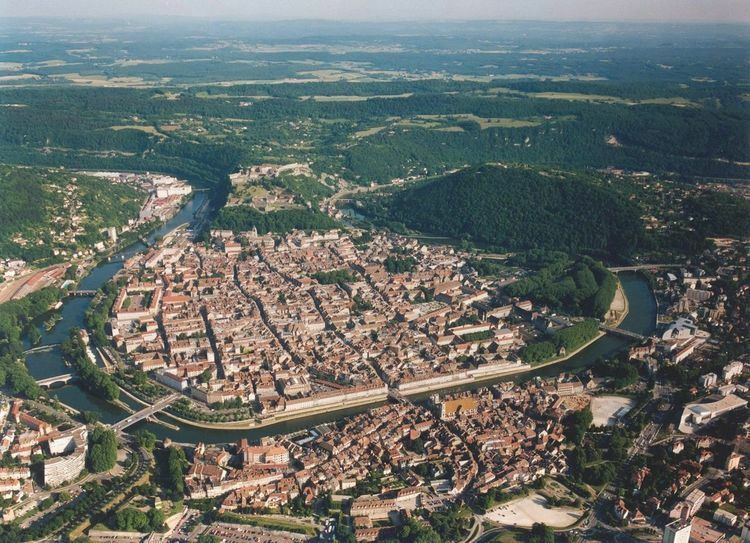 Besançon is the capital of the Franche-Comté région of France, a région including the four départements of Doubs, Haute-Saône, Jura and Territoire de Belfort. 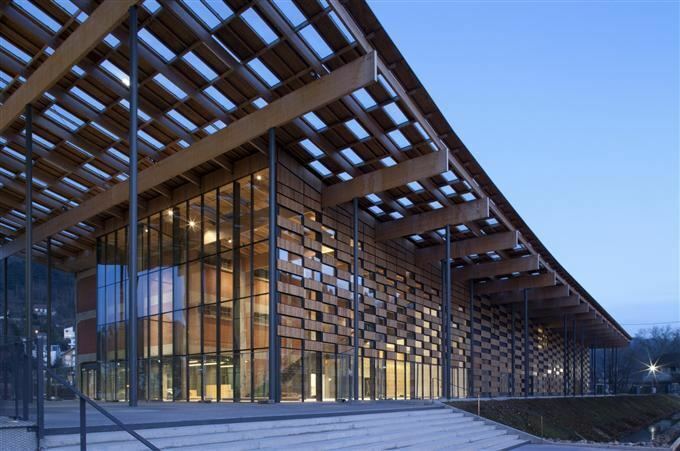 As such, it is the seat of the Franche-Comté regional council, and the regional préfecture (government offices). Mayor of the City of Besançon is Jean-Louis Fousseret. The city is famous for its microtechnology and watch industries. It is host of the biannual Micronora trade fair, one of Europe's major events in the field of microtechnologies. The city has a little-known specialty, automatic ticketing machines for car parking, airports, date stamping etc. The watch industry, for which Besançon remains the French capital, endured a major crisis in the 1970s when the advent of quartz watches from Asia knocked out the traditional watch industry in the space of just a few years. The famous "Lip" affair epitomizes the industrial crisis. LIP is to this day the name of one of Besançon's most prestigious brands of watches. Refusing to let their factory close, the workers set up a cooperative to run it. The action produced a lot of notoriety and sympathy for the workers but also resulted in branding Besançon as a city of the radical left. It also did nothing to help revive the watch industry; the cooperative went out of business a short while later. The city took a long time to recover from the collapse of the watch industry and its other major industry of the industrial age, artificial textiles. Since the 1980s, Besançon's watch industry has clawed its way back on the basis of its historic reputation and quartz watches, establishing itself in a number of niche markets including customized watches, high quality watches, and fashion articles. Since the 1990s, the town has developed a reputation as one of France's leading centres of technology in all fields, including telecommunications and biotechnology. Besançon is the seat of the Université de Franche-Comté. As of 2006, there were approximately 20,000 students enrolled at the university, including around 3,000 foreign students. The Institut Supérieur d'Ingénieurs de Franche-Comté (ISIFC), part of the Université de Franche-Comté, is the first school created in the country specifically for the Biomedical engineering field. The city is also home of the École Nationale Supérieure de Mécanique et des Microtechniques (ENSMM), a technological school with a strong reputation in the fields of microtechnology and mechanics and the worldwide famous Centre for Applied Linguistics which teaches ten languages to non-native speakers (French, Arabic, Chinese, English, German, Italian, Japanese, Portuguese, Russian, Spanish) and any other known language on request and which welcomes more than 4,000 students every year from all over the world. The Roman remains consist primarily of the Porte Noire, a 2nd-century CE triumphal arch at the foot of the hill on which the citadel stands, and the Square Castan, a semi-circular amphitheater. The Porte Noire may commemorate the victories of Marcus Aurelius over the Germans in 167 CE. It was partly rebuilt in 1820. From 1534 to 1540, Cardinal Granvelle, chancellor to the Habsburg emperor Charles V, built the Palais Granvelle, in the heart of the town. It consists of arcades that surround an interior court, and is the most interesting of the secular buildings. The Palais contains a set of seven wool and silk blend tapestries from Bruges that were woven circa 1635 and that celebrate seven milestones in Charles V's life. These tapestries remained in Spain until 1888, when they were transferred to France. In 1950 they were transferred to the Palais. UNESCO added the citadel, the city walls and Fort Griffon to its list of World Heritage Sites in 2008, as part of the "Fortifications of Vauban" group. Some older military architecture has also survived. There is a cylindrical, 15th-century tower near the Porte Notre-Dame, the southern gate of the city. The Porte Rivotte, a 16th-century gate, has two round towers. The citadel houses the Museum of the French Resistance and Deportation. The Cathedral, which dates largely from the 12th century though construction continued into the 14th century, contains the most remarkable of the city's masterpieces, a massive Virgin and saints altarpiece by the Italian Renaissance painter Fra Bartolomeo. It also houses a noteworthy 19th-century astronomical clock. The Cathedral has two apses, with the eastern apse and the tower dating from the reign of Louis XV. Attractive quays border the old city, and in places there are shady promenades. On the right bank there is a bathing establishment in the Mouillere quarter that draws its water from the saline springs of Miserey-Salines. Besançon also has one of the finest city art galleries in France outside Paris. The Museum of Fine Arts and Archeology has a collection whose origins date to 1694, and which a remarkable series of bequests have augmented over time. In the 1960s the architect Luis Miquel, a pupil of Le Corbusier, totally rebuilt the building. The building's interior takes the form of a gently rising concrete walkway that takes visitors up from classical antiquity to the modern age. Among the museum's treasures are a fine collection of classical antiquities and ancient Egyptian artifacts, as well as a very rich collection of paintings including works by Bellini, Bronzino, Tintoretto, Titian, Rubens, Jordaens, Ruisdael, Cranach, Zurbarán, Goya, Philippe de Champaigne, Fragonard, Boucher, David, Ingres, Géricault, Courbet, Constable, Bonnard, Matisse, Picasso and many others. As well as being famed as one of France's finest "villes d'art" (art cities), Besançon is the seat of one of France's older universities, of France's National School of Mechanics and Micromechanics, and one of the best known French language schools in France, the CLA. It is also reputed to be France's environmentally friendliest city, with a public transport network that has often been cited as a model. On account of the topography, the historic city centre lies at the edge of the modern city, and hiking tracks lead straight from the centre and up into the surrounding hills. The city council has been in the hands of the Socialists and parties of the left since the Second World War. King Willem-Alexander of the Netherlands is also the Lord of Besançon. The Christmas carol "Berger, Secoue Ton Sommeil Profond", known in English as "Shepherds, Shake Off Your Drowsy Sleep" originated in Besançon in the 17th century. Several major events occur annually in Besançon. One of the best-known is the Besançon International Music Festival, which takes place in September; it is one of the oldest and most prestigious Classical music festivals. Besançon hosts other music festivals such as the Herbe en Zik Festival (French rock and variety) in May, the Jazz en Franche-Comté Festival in June, the Franch Country Festival (country music) in August, and the Musiques de Rues Festival (street music) in October. The major sports in Besançon are soccer, handball and basketball. The city's soccer club, called Besançon Racing Club plays in the French seventh division. The city has also the International Football Academy of Orchamps Besançon for young players from 4 to 13 years. Labelled by the French Football Federation since the creation of the label in 2004, its purpose is to teach young players in all aspects of football to become good competitive players. ASOB Foot Besançon also had a fairly successful hockey team in the early 21st century. The Séquanes, named after an ancient gallic tribe, reached the French Cup final in 2002 (which the city hosted) and briefly played in the country's top league, then called Super 16. However the Séquanes' free spending policy soon backfired. The team folded in the middle of the 2002/03 season due to financial problems. Today, senior hockey subsists in Besançon in the form of a low level amateur team. The city also had a good Canoe-Kayak Club, Sport Nautique Bisontin, one of the oldest in France. Besançon is situated at the crossing of two major lines of communication, the NE-SW route that follows the valley of the river Doubs and links Germany and North Europe with Lyon and southwest Europe, and the N-S route linking northern France and the Netherlands with Switzerland. Unusually for a city of its size, Besançon does not have a commercial airport. Two international airports, EuroAirport Basel-Mulhouse-Freiburg and Lyon Saint-Exupéry International Airport, are about two hours away by car. Gare de Besançon-Viotte, the main railway station, sits in the centre of the city. Gare de Besançon Franche-Comté TGV is the high speed railway station and it sits some 10 km (6 mi) north of the city. A tramway commenced service in September 2014. The length of the line is 13 kilometres (8.1 mi) and the route follows a mainly South-West-North East direction through the city between Hauts du Chazal and alternative destinations of Chalezeule ("parc Micaud") and the Besançon railway station at "Gare Viotte". Ginko runs Besançon's urban bus routes. Marie Louise Outhwaite (née Roget) (1814–1905), prominent early settler of Auckland, New Zealand.